A 32-year-old man was diagnosed with HIV in 1998 based on a low CD4 count. He was placed on an antiretroviral regimen for 2 years before then becoming noncompliant. As a result, the patient’s CD4 count plummeted and viral load steadily increased. His medical condition deteriorated and he was diagnosed with cryptococcal meningitis with positive CSF culture. At this point the patient was placed on a broad-spectrum antibiotic/antifungal regimen along with HAART (highly active antiretroviral therapy). Following a short interval of clinical improvement when his CD4 count rose and viral load plummeted he became gravely ill, presenting to the emergency room with weakness, headache, neck stiffness and intermittent bouts of fever. 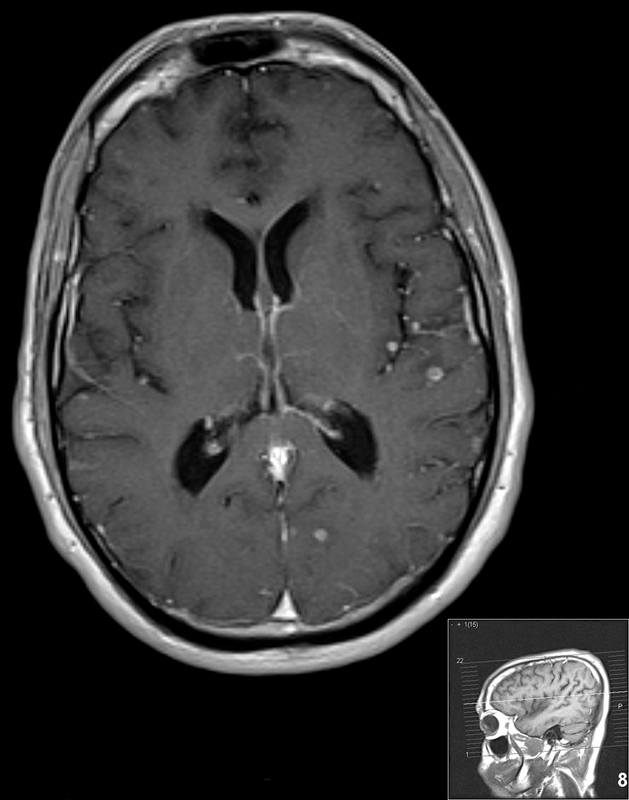 The patient was clinically diagnosed with cryptococcal meningitis; however, the CSF was negative for cryptococcal antigen and cultures were negative. The patient showed dramatic clinical and radiological improvement after high-dose steroid treatment. 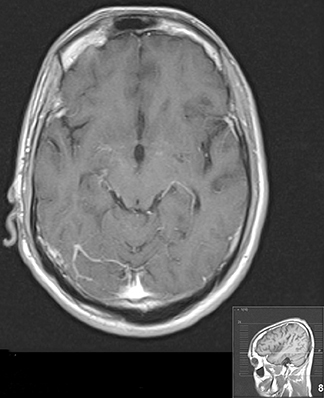 Magnetic resonance of the brain was performed (Figures 1, 2 and 3). Contrast-enhanced MRI of the brain revealed multiple small, round, ring-enhancing leptomeningeal lesions in the supra/infratentorial compartment with diffuse meningeal enhancement and areas of linear enhancement in the Virchow Robin spaces. These findings are highly suggestive of cryptococcal meningitis and cryptococcomas. 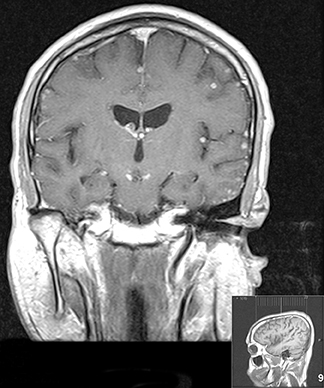 A subsequent MRI scan following high-dose steroid therapy reverted back to normal. Immune reconstitution syndrome remains poorly understood. Its development appears to be linked not only to increases in CD4 cell levels, but also to higher CD8-cell counts induced by HAART. An elevated CD8-cell count has been suggested as a prime contributing factor in worsening of both herpes zoster and hepatitis B or C symptoms after the initiation of anti-HIV therapy. Researchers have also proposed that the increased activity of cytokines contributes to some forms of IRS.4 The incidence of IRS varies depending on the study, the population under investigation, and the associated pathogens. Though most individuals starting HAART are not likely to experience IRS, radiologists should remain alert and try to correlate the imaging finding with the clinical picture and pattern of change in the CD4 count and viral load. Immune reconstitution inflammatory syndrome is a known clinical entity in HIV infection. In IRS, as a result of restored immunity, HIV-1-infected patients receiving highly active antiretroviral therapy (HAART) may experience atypical and worsening clinical manifestations of opportunistic disorders. Patients generally have a positive response to steroid treatment along with HAART. Definitive diagnostic criteria and therapeutic guidelines for IRIS have still not been achieved. Lortholary O, Fontanet A, Memain N, Martin A, Sitbon K, Dromer F. French Cryptococcosis Study Group. Incidence and risk factors of immune reconstitution inflammatory syndrome complicating HIV-associated cryptococcosis in France. AIDS. 2005;19 (10):1043-1049. Jacobson, MA. Clinical implications of immune reconstitution in AIDS. HIV Knowledge Base Chapter. January 2006, University of California San Francisco. hivinsite.ucsf.edu/InSite:page:kb-03-04-03. S.J Buckingham, L.J Haddow, P.J Shaw, R.F Miller. Immune reconstitution inflammatory syndrome in HIV infected patient with mycobacterial infection starting highly active anti-retroviral therapy.Clinical Radiology. 2004;59(6):505-513. Pomerantz, RJ. Immune reconstitution syndrome in AIDS. AIDS Patient Care and STDs. Center for Human Virology, Division of Infectious Diseases, Thomas Jefferson University, Philadelphia, Pa. 2003:17(3):99-101. Radiological Case: Immune reconstitution syndrome in HIV infection. Appl Radiol. Prepared by Dr. Madan while practicing at SUNY Downstate Medical Center; Dr. Choi while practicing at Downstate Medical Center, and Dr. Gupta while practicing at the Veterans Administration Medical Center in Dallas, TX.